From a trout's perspective, soft hackle gives nymphs a bit of added attraction. The lifelike movement offered by the floating fiber draws a fish's interested, and as the fly swings—emerging and swimming to the surface—it's time for a strike. 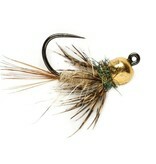 This traditional pattern is tied on a barbless, claw-point tactical jig hook.